You think the piano is one instrument? It is a hundred instruments! The dynamic possibilities of the piano are amazing: from an extreme pianissimo to the greatest fortissimo and to many thousands of gradations in between! Its tone can be soft like the summer breeze, delicate like the rustle of leaves, expressive like the sound of a violin or cello, deep as the hum of the ocean, powerful as a thunderstorm! By learning how to create different sound intensities, how to ‘play’ with various dynamic gradations, you will take your expressive skills to a whole new level, bringing out the artistic concept of each piece in a professional, captivating manner. This is the 1st episode from my series of 7 video tutorials Between Pianissimo and Fortissimo. Improving the Piano Dynamic Range. Episode 1: Exploring the Real Dynamic Possibilities of the Piano. Tip No. 1. Activating and Training Your Hearing. Before we start exploring the piano dynamics, don’t forget about activating your hearing and keeping it as sharp and objective as possible. Yes, this tip may sound a little boring, but it’s fantastically effective. Ask yourself a simple question: How can you produce a wide range of different dynamic gradations, how can you play with contrasts, how can you create convincing musical images and characters if you can’t perceive and distinguish these gradations in the first place? The first one is called pressing the keys randomly and waiting for what will come out – without imagining first the desired sound intensity. The second mistake is called wishful hearing: it means imagining the desired sound intensity, but not knowing how exactly to produce it by using the real possibilities of the piano and even worse – thinking that you play forte, when in fact you create only a modest mp. You have to train your imagination and your inner hearing – so that when you see the indication pp, f or mp in your score – you will instantly imagine how this dynamic gradation should sound. Then, you have to develop your objective hearing, as opposed to wishful hearing. It means hearing the real sonority produced by the instrument – and not the sonority that you would like it to have! In other words, your vision and your muscles have to be in perfect coordination – and during these 7 episodes I’m going to show you in detail how to do this. However, when it comes to activating your hearing, the most important thing is awareness – simply remembering about it! So, each time you play something, don’t do it mechanically! Make sure you listen to the sound intensity carefully and ask yourself: is this a real forte? Or maybe you only think that you played forte? Is the piano soft enough? Is this mf expressive? With practice, you’ll train your ear to hear the difference between, let’s say – a pp and a p or between f and mf. The good news is that when we train our hearing, we influence directly the quality of our tone – but more about this in one the next episodes! Tip No. 2. Which is the Real Dynamic Range of the Piano? Let’s make a little experiment: we’ll pay a note or a chord really loud – on fortissimo – and we’ll listen to all the details of the fading sound – down to the very last moment of its extinction. As you all know, the piano is the only instrument whose sound does not last after being produced. After we press a certain key, the tone will immediately begin to fade away. So when we listen to the sound fading away we actually perceive all the possible gradations of the sound volume – from ff to pp. So this is our realm, our dynamic universe – full of different intensities, colors and shades of the sound – the building material that allows us to create countless different musical images and characters. Tip No. 3. ‘Not a sound yet’ and ‘not a sound anymore’. Heinrich Neuhaus used to say in his book “The Art of Piano Playing” that each phenomenon in this world has a beginning and an end, including the tone of the piano. We could talk for hours about the richness of the piano sound – but where exactly this sound begins and where does it end? Actually, Neuhaus had two funny names that he used for showing his students the real limits of the piano sound. The first one is ‘not a tone yet’ and the second is ‘not a tone anymore’. Try to depress a key really slowly, without any effort. This is ‘not a tone yet’ – because the hammer is raised but it didn’t strike the string. Now, try to produce the softest possible tone – this will be our lower limit of the power of the sound. Now, by gradually increasing the force of the action and the height at which your hand is raised – we can reach, step by step, the volume of the sound until we reach what Neuhaus called ‘not a tone anymore’ – it’s the percussive noise which results from a brutal key attack combined with an excessive speed. So, if we depress a key too slowly, we get nothing: it’s not a sound yet! If we let our hand fall on the key too fast and with too much force, than we get a noise – and this is not a tone anymore. Now we’re interested in mastering everything in between! In the next episode we are going to talk about one of the most important secrets of the Russian piano school – the whole arm action principle – and how it can influence the volume of the sound. I’m also going to show you the No. 1 mistake that most beginners make when it comes to creating a wide range of dynamic gradations – and how you can correct it. 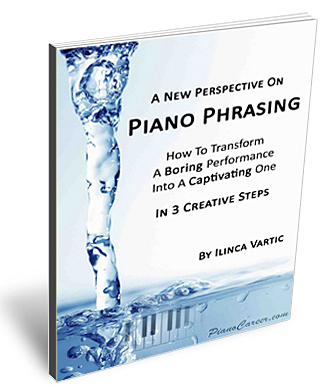 Become a member of my Piano Coaching Program at PianoCareerAcademy.com and get instant access to hundreds of detailed exclusive piano playing tutorials that reveal the secrets of the Russian piano school – including to the next 6 episodes about the piano dynamic range. On the Private Members Forum you’ll also be able to ask me ANY piano question, anytime, and receive personalized, detailed, professional piano advice! I enjoyed this very clear and interesting presentation on the dynamic range of the piano. Well done. Kind Regards from a piano teacher in Australia. I will be sending this link on to some of my students who would understand and benefit from this. very interesting, thank’s for posting! You can find hundreds of other detailed tutorials dedicated to a wide array of piano topics (including step-by-step courses) on my Piano Coaching Program at PianoCareerAcademy.com (where I continue to post 2-3 new video tutorials each week). I really don’t understand why your page and your youtube posts managed to escape me all these years. I just happened to stumbled upon them last night…and really, HOLY F!!! Your teachings are the ones I have been looking for!! !…very well explained, very understandable…even to a lab monkey I suppose lol. But seriously, thank you so so so very much for your tireless efforts in helping a lot of people to improve their techniques and such. If you don’t mind, I’d like to ask a few questions…no hurry…just something that popped in my head…. 1. How do you choose a good piano in terms of sound quality, touch, etc.? 2. Could you share your thoughts regarding similarities/differences in acoustic and digital pianos?